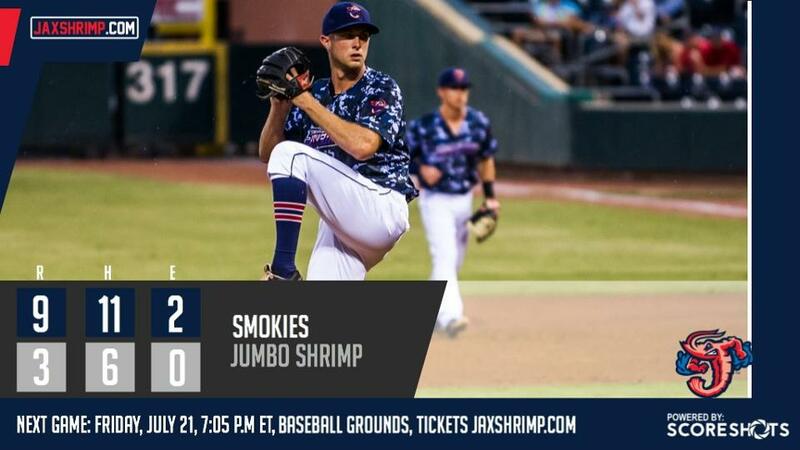 JACKSONVILLE, Fla. - Jacksonville Jumbo Shrimp pitchers struck out 13 Tennessee Smokies - each time raising $5,300 from Fifth Third Bank for Stand Up To Cancer - and with 5,898 in attendance meaning another $5,898, the single night raised $74,798, while Tennessee won a 9-3 final Thursday night at the Baseball Grounds of Jacksonville. Jumbo Shrimp right-hander Trevor Richards (2-2) fanned nine batters in the first six innings, including a stretch from the second to fourth inning that included seven straight strikeouts - one shy of the Southern League record. Right-hander Tyler Higgins struck out one, and left-hander Victor Payano struck out three. The 13 were two shy of the club's season high. Tennessee (16-11 second half, 52-44 overall) tallied a first-inning run, after center fielder Trey Martin hit a leadoff double to right field and scored on third baseman Jason Vosler's sacrifice fly. Jacksonville (13-14, 43-54) answered in the bottom of the inning against Chicago Cubs rehabbing left-hander Brett Anderson (2-2), as center fielder Kyle Barrett reached on an error by shortstop Carlos Penalver, and left fielder Austin Dean hit an RBI double to left field, reaching third base on left fielder Daniel Spingola's error. After right fielder John Norwood walked, first baseman Dustin Geiger hit an RBI single to center field, and catcher Rodrigo Vigil hit a one-out RBI single. Anderson did not allow another run in his six total innings. The 3-1 score remained until Spingola's fifth-inning solo home run to right field. Richards began the seventh inning with a 3-2 lead but allowed an infield single to right fielder Yasiel Balaguert and second baseman David Bote's single. Higgins entered, recording one out on a bunt fielder's choice, before a walk, catcher Cael Brockmeyer's game-tying single, pinch-hitter Andrew Ely's go-ahead single, and first baseman Ian Rice's two-out, bases-loaded walk. Vosler added a two-run single off left-hander Jeff Kinley to make it 7-3. Richards allowed the first four runs, while Higgins allowed three. In the eighth inning, Payano allowed a two-run single to pinch hitter Kevin Cornelius, extending the 9-3 Smokies lead. UP NEXT: The Jumbo Shrimp continue their series with Tennessee at 7:05 p.m. Friday, when Jacksonville right-hander Joe Gunkel (3-6) is scheduled to face Smokies right-hander Trevor Clifton (5-5). Fans may visit any participating NAPA AutoCare Center to get a FREE general admission ticket for the games, which will be followed by NAPA AutoCare Family Fireworks. The Jumbo Shrimp will wear red "Bold City" jerseys on Red Shirt Friday, and fans who wear red can save $1 per ticket at the box office, or donate the $1 to the Intrepid Fallen Heroes Fund. Gates open at 4:30 p.m. for Miller Lite Happy Hour, presented in part by Wild Wing Café, with Miller Lite beer specials in the Craft Cave inside the third-base gate until 7:30 p.m. The Wheelhouse Chef's Table will include a buffet in the suite-level lounge open to all fans for $12 per plate. The game is presented by WEJZ Lite 96.1.